Without Griffith Pugh, Edmund Hillary's pioneering ascent of Mount Everest would never have been possible. So why have you never heard of him? Above: Griff Pugh at work at altitude | Photo Credit: Royal Geographical Society (with IBG). Scientists almost never get to be household names just for doing science. Most who impact the public consciousness, like Brian Cox, Richard Dawkins and Stephen Hawking, tend to at least combine the science with being best-selling authors. You might just encounter (Francis) Crick and (James) Watson in a pub quiz for their discovery of the structure of DNA, but what about the structure's true discoverer, Rosalind Franklin, whose X-ray diffraction photographs first revealed the molecule's double helical arrangement? What about (Alan) Hodgkin and (Andrew) Huxley, responsible for working out the basis of nerve transmission, one of the 20th century's greatest discoveries in biology? Given that other pre-eminent discoverers, even Nobel Laureates, remain relatively unknown, it's probably not a great surprise that you haven't heard of Griff Pugh. Pugh – full name Lewis Griffith Cresswell Evans Pugh – was a pioneer of what we now call exercise physiology. Through the 1950s, '60s and early '70s he studied human physiology at extreme altitudes, such as in the Himalayas, looking into survival in cold water and extreme weather, and researching human performance in extreme heat. Pugh was also a proponent of "physiological expeditions" – the idea that some insights into human performance in extreme environments were best made in those conditions in the field, rather than just re-creating them in the lab. His name is revered in sports physiology circles. Above: Hillary and Tenzing | Photo Credit: Wikimedia Commons, CC BY-SA. But why should you have heard of him? Because his work made possible, among other things, the first ascent of Mount Everest by Edmund Hillary and Tenzing Norgay in May 1953. While Hillary and Norgay became household names, along with others like expedition leader John Hunt, memory of Pugh's work and its critical role in the ascent has been largely consigned to dusty archives and academic literature. So what was Pugh's contribution to the 1953 ascent? It was to recognize clearly, and to work out how to tackle, the multiple physiological challenges of the climb: lack of oxygen at altitude; rapid loss of body fluids; the need for lots of calories; the importance of recovery after strenuous climbing effort through comfortable sleep. Pugh systematically assessed all of these, first on an exploratory expedition to the Himalayas in 1952, and then in his laboratory at the National Institute of Medical Research in Hampstead, London. He tested how fast climbers carrying loads could climb with and without oxygen, and worked out exactly how much bottled oxygen they would need. He calculated the fluid intake the climbers would require, and even re-designed the stoves that would be used to melt the snow to supply it. Pugh was also a member of that 1953 expedition, performing physiological tests on the climbers, but his key job had begun long before. The importance of his work for the Everest ascent cannot be underestimated. Many previous expeditions had failed. An elite squad of Swiss mountaineers – seasoned professional Alpinists, rather than the British and Commonwealth team's "gifted amateurs" – narrowly failed to reach the summit in 1952, possibly because the Swiss climbers were weakened by serious dehydration. Swiss mountaineer and doctor Oswald Oelz would later opine that if the Swiss had had a scientist like Pugh helping them, they would probably have made the summit. Through his career, Pugh repeatedly applied his research to solve real-world problems. How and why did some people survive long periods in cold water, and others not? Why was cold and wet so much more deadly to walkers caught on the fells than either on its own? He contributed important insights to both of these. His scientific crowning glory was the so-called Silver Hut expedition, a meticulously planned experimental foray to the Himalayas in 1960-61. It was co-led with Hillary and arose out of unanswered questions raised by the Everest expedition about how body function was altered at altitude and by acclimatization. A team of scientists, many later eminent in altitude physiology and medicine, lived and worked for months near 6,000 metres – a feat not repeated for many years. The expedition remains a key signpost in the discipline, repeatedly cited more than 60 years on with many still-valid findings. As a scientist, Pugh's gift was for recognizing a problem clearly and taking the measurement to it when necessary – lab work could contribute, but needed to be combined with field measurements. The basic experimental techniques he used were well-tried, and sometimes decades old by the 1950s; for instance, collecting exhaled air in a large bag for analysis. But his analytical approach, ability to adapt equipment and flair for organizing the work (though in all other respects he was famously disorganized) all stand out. Another feature of Pugh's work was realizing that individuals with a relevant special talent, or ability, were a likely source of illuminating data. He studied cross-channel and other long-distance swimmers to learn about cold-water survival, for example, and published a paper on a Himalayan pilgrim who could maintain his core body temperature even when sleeping at nearly 6,000m without special clothing. Pugh's fall from view owes much to the way accounts of the Everest Expedition "framed it", as we would now say, as a triumph of the human (and more specifically British Imperial) spirit. With contemporary accounts of the expedition written by the climbers, the science was unsurprisingly downplayed in favor of the human drama and its heroic dimension. Expedition leader Hunt always chose to describe the scientific and technical work underpinning the ascent as a team effort – which it certainly was, but which largely erased Pugh's key role at the centre of it all. Pugh himself also contributed to this impression by never writing a popular account of his work, which instead appeared as rather dry technical appendices. However, the appendices were read – by mountaineers. 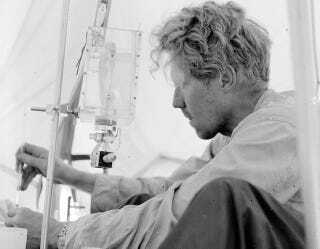 Before the 1953 Everest ascent, only one of the world's 14 peaks higher than 8,000 meters had been climbed; by 1958, all but two of them had been, all with bottled oxygen, and by climbers following Pugh's blueprint. Photo Credit: Pathos Photos, CC BY-NC-SA. While Pugh's reputation has remained high in scientific circles, his profile in the wider world beyond has gained a new lease of life thanks to a brilliant biography, written by his daughter Harriet Tuckey and published last year. She tells both the scientific story, and a very human one of coming to know and understand her late father – a difficult and prickly individual from whom she was estranged in his lifetime – by delving into his work and interviewing those who had worked with him. The book has won several awards, and was nominated for British Sports Book of the year. A new mainstream interest in Pugh is a welcome thing, as is the recognition of the role of science in making the expeditions he was involved in possible. Austin Elliott does not work for, consult to, own shares in or receive funding from any company or organization that would benefit from this article, and has no relevant affiliations.